This evening I sit at the beach with the tide of the Red Sea almost caressing my feet. 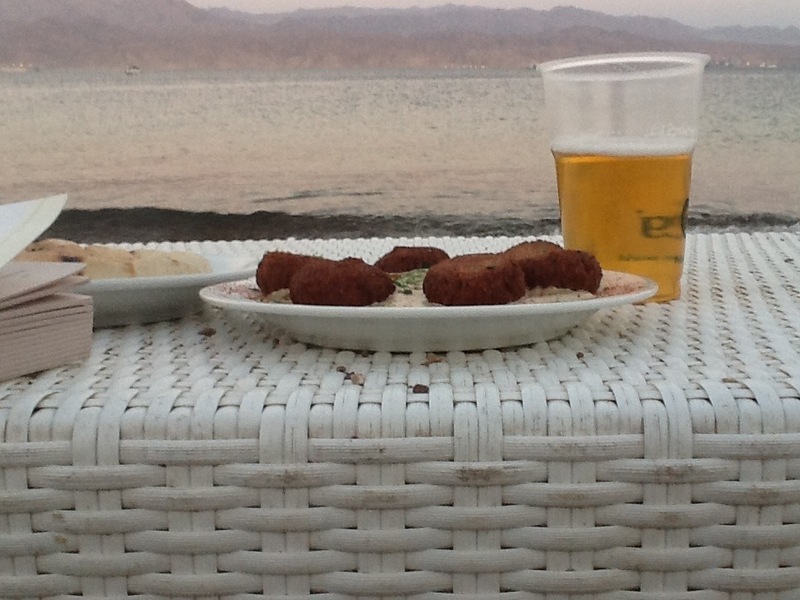 I am overlooking the gulf of Aqaba and enjoy a nice cold beer, falafel and tahine. The past week of my stay in Eilat, Israel, was dedicated to something that has become more than just a hobby: SCUBA diving. The week started with my suitcase still in Tel Aviv (thank you for the mixed info at Schiphol, ElAl). Fortunately enough I did not plan any diving the first day and the people of Israir were kind enough to deliver the suitcase on their first flight to Eilat. I could finally get out of my jeans and into the waters (28C at the surface!). After a refresher and two easy guided dives, it was time to start the PADI open water advanced course with one Yaniv Mizrahi. With Michiel van Staaveren, a good friend of mine, I have found myself in a couple of discussions on artisanship and the value of professionals who not only understand their work, but are passionate about it (Michiel even argues that these people should never be promoted!). Here in Eilat I found a true artisan. Diving with Yaniv (who runs Dive Israel), is something special. Here’s a guy with a simple web page and who is so passionate about diving and the aquamarine life that he started a diving school next to his job as a teacher in Economics at the University. He even helps small start ups with their online strategies. When I inquired for the course over the phone some two weeks ago, this passion of his was transferred to me. And instead of me asking for possibilities and options, he was the one inviting me to come diving with him. Each and every dive was fun (some more due to higher levels of nitrogen in the brain) and eventhough the course set clear goals and skills to obtain, he added something special to each of the five dives. One experience I want to share with you is the “blue dive”. We ascended from the sea bed to level at 7 meters below the surface. So there I was, perfectly neutrally buoyant (not sinking nor rising), with the sea floor 17 meters below, the sky starting at 7 meters above and all around me the perfect blue sea. Even still in tourist mode, this was a spiritual and mind blowing experience that I can recommend to everyone. With my new found skills, the next two dives were excellent. Places like Eilat lost their appeal to me some years ago, I find them too crowded, too noisy and detached from meaningful human and cultural interaction. But the air, water and food are amazing. 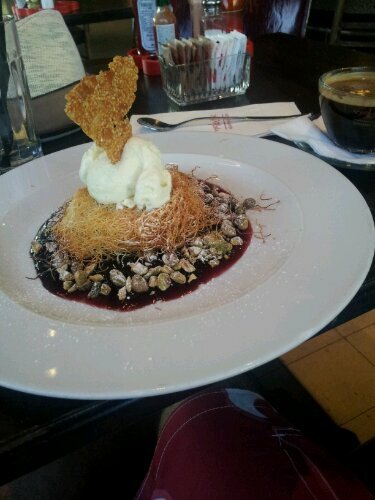 As for the food, The Last Refuge was the best, as for the atmosphere, Yan’s bar at Veranda Beach. The latter being the place where I wrote this blog and took this picture. It is spectacular to see the night fall on noisy Eilat in the distance, the Red Mountains of Jordan above Aqaba, the thin shore line of Saudi- Arabia and the stretches of the Sinaï down the Red Sea. The winds blowing from the red mountains of Aqaba and the Negev are calling me for the next two legs of this trip. In Petra I hope to intersect and continue on the path of the Pilgrim and leave the one of the Tourist for a while (it’s hard and expensive, two facts that are for sure). I like to maintain an open mind and reservations on expectations, but walking in the paths of the ancestors and T. E. Lawrence in the valley of Wadi Rum is more than inviting. After that, a full week in Jerusalem awaits me for yet another chapter in the life of this Pilgrim/Tourist. – I had to recall my parents’ names a dozen times as I progressed through various security checks. I think that they most probably have sneezed their asses off. – luckily I have stocks in beer, not in foam. I get confuzed looks when holding two fingers to the glass. – a friend of mine recommended birckenstocks (no slipper deserves its name in capitals), I found my bristol panthers better value for money. – Israelis love chips (french fries), the portions are huge and consumed throughout the day. I expect to only find acres of potato fields during the bus trip to Jerusalem next week.